Read with interest that Cox Plate invitee Benbatl has bounced back to form with a Group One victory in Germany. 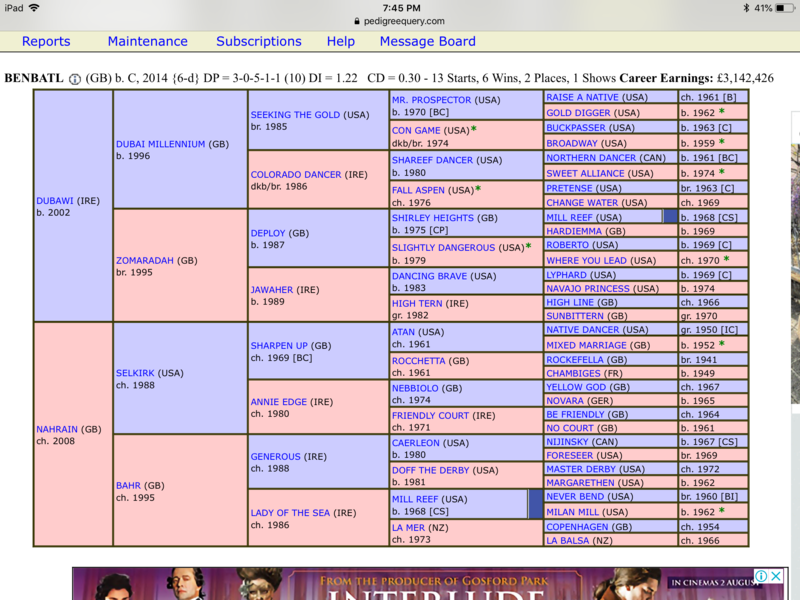 Looking at his pedigree it was interesting to see La Mer 4 gens removed on the bottom of the page. I don’t know to much about this family since the great filly raced in the mid 70s but would be interested in thoughts on what may have activated this pedigree to leave a horse of Benbatl’s quality. In terms of the dam line I guess class is permanant but do you see any other influencing factors? interesting but not overly excited. La Mer was foaled in N.Z.of 100% European blood, related to Ribot. Pretty sure that Rob Muldoon raced one of LaMers first offspring. Can't be 100% sure but the name Nukamara or something similar was its name. Class horse - classy ride - tidy field. La Mer, Uncle Re us, Shivaree, Shuzohra, Damn that's a field of the likes we haven't seen here in a generation! Nahrain was champion filly of her year. Lucky For All won at Caufield yesterday , La Mer is his 3rd dam. She is the fastest horse I ever rode... a super mare, had a mind of her own but an absolute superstar. I watched with my boss Malcolm Smith in the car park at hastings her last race the Ormond Memorial,which she won, after they had sold her...it was so sad..it was a big story at the time, but i think she was the first of the real big international purchases of broodmares. Not normally the way you express the close relation tie up. It universally means that through the dam there is a close relationship, not an inbreed to the stallion.